The Pura Vida Program offers free fitness and nutrition classes to provide participants with the tools, knowledge, and inspiration to journey towards a healthy lifestyle. Classes are offered in Faribault and Northfield during weekday evenings for anybody interested in becoming more active or maintaining a healthier and happier lifestyle. Pura Vida classes offer a fun and supportive group environment in which participants engage in cardiovascular and strength training to improve their overall health. With Zumba® Fitness, participants exercise while enjoying Latin and International rhythms. And for those looking to reduce stress, Pura Vida offers yoga classes thru the help of community volunteers. Pura Vida classes are offered in Faribault and Northfield. 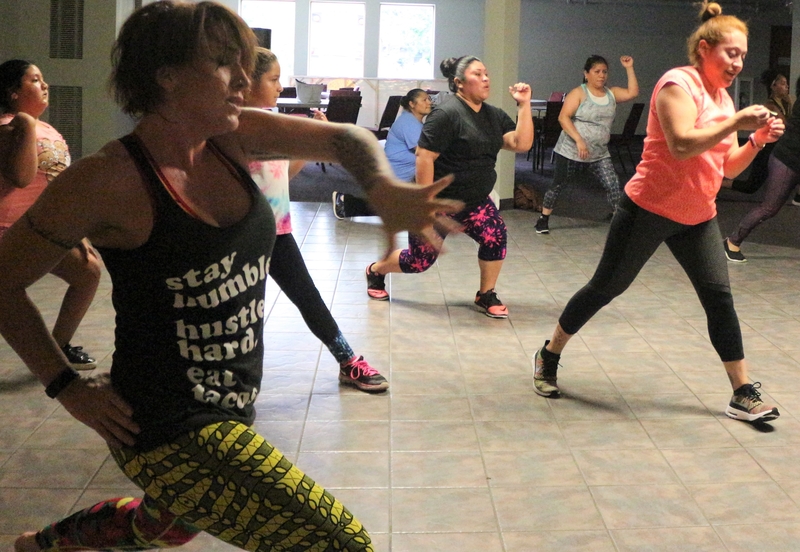 Additionally, a women’s-only fitness class is offered in Faribault once a week. All classes are an hour long. Many are led by volunteers, bilingual in Spanish and English. No previous exercise experience is necessary, and all classes are free and open to the public! Childcare and transportation are available upon request, according to availability. The Diabetes Program provides group-based support and education to equip those diagnosed with diabetes, with the tools they need to successfully understand and manage their diabetes at home. Two programs are available. The Principiantes course is a 6-month, 6-session program for newly diagnosed patients and new members, while the Avanzandos group is designed for participants who have completed the first course. Avanzandos participants meet quarterly to provide continuing social and educational support for diabetes management. Participants receive diabetes testing supplies, medications, education, and medical care along with individual clinician consultations that are available as necessary. Both programs are available in Northfield and Faribault. Participants in the Principiantes program attend 6 monthly classes, including sessions on eating for diabetes control, blood glucose testing, making the most of your medicine, and exercising for your health. All classes are led in Spanish or co-led by a bilingual facilitator and clinician. interactive education, and time to socialize with other members of the program. HealthFinders or partner providers refer patients to the Diabetes Program and the care coordinator assists patients with enrollment. The clinic coordinator then completes the intake process. New participants meet with the diabetes nurse coordinator to learn more about the program and to set goals. Diabetes Program participants are asked to attend and participate in monthly classes, fulfill lab and clinic appointments or give 24 hour’s cancellation notice, and bring pill bottles and monitoring logs to all appointments. Participants are also asked to do their best to make recommended changes to their medications, diet and lifestyle, and to be open and honest with clinic staff. Mejorando la Salud de los Adolescentes (MESA) is a collaborative project, made possible by a grant from the Eliminating Health Disparities Initiative (EHDI). MESA was created to engage the community in reducing the gap between non-latino and latino teen pregnancy rates and HIV/STIs in Rice County. It partners with Growing-Up Healthy, Northfield Healthy Community Initiative, and Rice County Family Services Collaborative to provide the Teen Outreach Program (TOP) and the Comadres/Compadres Pregnancy Prevention Program.